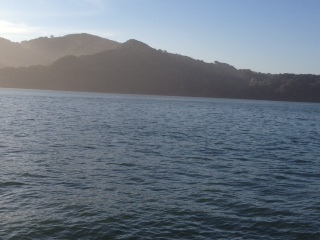 Angel Island is a jewel in the middle of San Francisco Bay. “Since the time of the Civil War, Angel Island has either been the site of military protection of the entrance to San Francisco Bay, a station for immigrants coming across the Pacific Ocean, or a military fort and staging area.” (PowerHIking San Francisco 3rd edition, pp.167) It is now part of the National Park System open to the public and a wonderful place to visit for the entire family. There are picnic tables, a beach, trails, a 5 mile road around the island, historic buildings and a trail to the top of Mount Livermore. Situated in the middle of the Bay, the views from the top are awe inspiring. Easily reached by ferry boat from the waterfront in San Francisco or the waterfront in Tiburon, a visit to Angel Island in this glorious spring weather is not to be missed. The weather was spectacular in San Francisco today and PowerHiking was out exploring and enjoying. 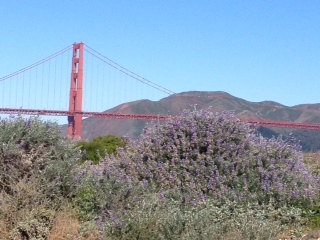 We walked the promenade at Crissy Field along the Bay and the wildflowers were abundantly in bloom and gorgeous. It is well worth a visit to Crissy Field if you are in the area. You can find the walk in Chapter one of PowerHiking San Francisco. www.powerhiking.com Enjoy the views. Relax as you stroll and watch the tankers plow under the Golden Gate Bridge. Visit the Bridge Pavilion if you walk that far. Visit the Warming Hut for coffee, water, a snack and a peak at PowerHiking San Francisco. 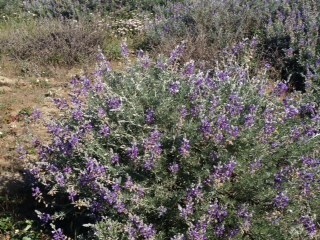 Enjoy the wildflowers and enjoy your day! POWERHIKING had a preview visit of the new San Francisco Exploratorium opening at Pier 15 on the San Francisco Embarcadero. 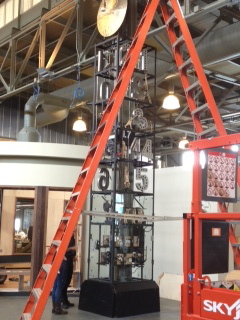 It is fabulous and has lots of space to grow at pier 17. Many of the hands-on and interactive exhibits will be outside the building on the public promenade around the outside of the pier. One needs a ticket to enter and it can be purchased online. At one end of the building sticking out in the bay at the end of the pier, is the Observation Point. What a view! There will be a restaurant and outdoor terrace. 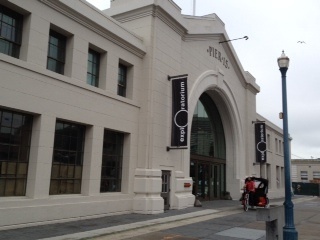 This amazing new facility and wonderful addition to the San Francisco waterfront opens on April 17th. It is not to be missed and will be thoroughly enjoyed by all members of the family! What a unique and special use of an unused shipping pier. Enjoy it! You are currently browsing the Powerhiking's Blog blog archives for April, 2013.